Nintendo can be credited for a lot for setting the mould for modern controller design. The n64 brought analogue thumb sticks to the mainstream gaming market and since then almost every game controller has included this hardware. Ever since then Nintendo have continued their trend of innovating controllers with the Wii. The Wii was hugely successful and brought functional motion controls to the gaming community but the motion control wand design was not the next big thing for controller design. The Wii U is the latest controller released from Nintendo and has brought a new controller along with it. The controller contains a screen along with standard buttons to play games with. The controller functions the same way that the PS vita does with remote play using the ps4. the controller is a good idea but isn’t a design that could replace the standard game pad design we are all use to. 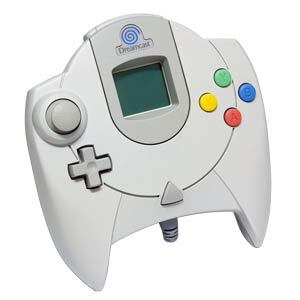 Sega are no longer in the console game which is unfortunate as the last controller they ever designed for a games console was the Dreamcast controller. The Dreamcast lived a very short life and as a result not many gamers got the chance to use this controller. The controller similar to the n64 controller allowed gamers to insert expansion hardware giving the controller additional functionality. It was a strange looking thing but at the same time it was quite cool. The original controller for the first Xbox was a giant! It was quite difficult to use for people who had small hands which made people dislike it when compared to the ps1 that had small, easy to hold controllers. The design was quite similar to that of the dual shock with the only difference being the position of the analogue thumb sticks. Microsoft have modified the design since then and the current Xbox one controller would seem to be the best so far but overall it has not changed much. The controller for the Xbox one is a very solid controller but lacks anything new and unique to make it special. PC gamers have never really concerned themselves with game controllers. the Xbox 360 controller has native support for a lot of games on steam but most PC gamers agreer that nothing beats a keyboard and mouse. Sony have never been particularly inventive with their controller design. Ever since the release of the first dual shock controller the design of the controller has remained more or less the same. This was never an issue as the design was popular and worked well. Before the release of the ps3 Sony unveiled the infamous boomerang controller which fans have become desperate to get a hold of. This design was abandoned and Sony released the six axis which was just a dual shock 2 without the shock! Sony surprised us with the announcement of the Dualshock 4 which was a completely new design and from what Sony told us it was set to be one of the coolest controllers we had ever seen for a Playstation console. Let us compare the Dualshock 4 to the Dualshock 3. The Dualshock 4 does everything that the old Dualshock 3 did. It has tilt controls, it vibrates, has a built in rechargeable battery and it doesn’t contain any less buttons. The R2 trigger buttons are curved inwards to make them more comfortable to use which was one of the more annoying things about the Dualshock 3. The shape and size of the Dualshock is much more comfortable to hold and was built to cater almost all hand sizes. The player indicator light has been replaced by a large light bar. The Start and Select buttons no longer exist on the Dualshock 4 and are now called Share and Options. This seems like a good decision as Start was generally the way to access the ‘options’ screen for a game. The Dualshock 4 sets itself apart from other controllers by having some new features that aren’t new but also aren’t found on other controllers. The first addition is a touch pad above the analogue sticks. This touch pad can be pushed down like an normal button but also allows the user to perform swipes along it using your finger. This was used quite well in Infamous Second Son where you would swipe across the pad to open doors and lift certain objects. Touch controls are nothing new but this is the first time they have been implemented as a secondary means of control. The share button while not a directly a feature of the controller is incredibly useful as it allows gamers to take screen shots, record gameplay and stream gameplay without having to look at any options and setup menus. The controller now contains a mic/headphone jack at the bottom of the controller. This is something that Microsoft had had in Xbox controllers in the past but the Dualshock 4 now allows you to output game audio. This is a brilliant feature as it allows you to listen to all of the in game audio without bothering anyone else and without having to pay for wireless headphones/have a long wire coming from the TV for your headphones. The Dualshock 4 delivers everything you would expect from a controller in a small, solid, easy to hold package that looks pretty and contains a bunch of additional features on top of the core functionality. The Dualshock 4 is familiar to all gamers while at the same time being completely new. Nintendo did try to create something new with the Wii U controller but in the end they just created PS Vita Remote play. Microsoft changed the design with the Xbox One controller but at the end of the day it’s a basic controller that does what it needs to do and nothing more, the lack of rechargeable batteries included with the product shows that they have purposely gone for a basic approach. The title of best controller this generation most definitely goes to the Dualshock 4 and out of all the controllers I have ever owned and used I would consider the Dualshock the best controller of all time.